DECORATE...CELEBRATE...SHARE THE CHEER! A wreath of greens and burning candles capture the warm, inviting 'all-are-welcome' ambiance of the season. 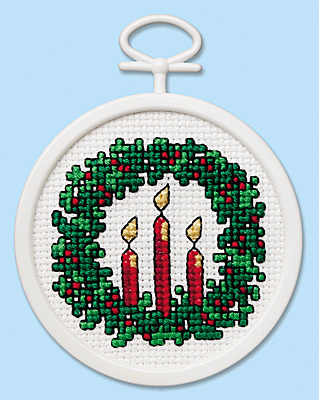 QUICK AND EASY and learn how to cross stitch, too. This Counted Cross Stitch Beginners design is a heart-warming gift for any star gazer. A unique WHITE KEY CIRCLE FRAME INCLUDED. Each kit contains 18-count White cotton Aida fabric, 6-strand cotton floss, frame, self-adhesive mounting board, needle, graph and instructions in English and French. Stitch Count: 33W x 32H. Size: 2.5" round (6,4 cm rond).